That Wolverton and area has changed dramatically in the past 40 years is plain to all who grew up in the area prior to the Milton keynes development. Less obvious, and now buried, were the old road patterns that were disrupted by the canal cutting of 1800 and the railway construction in 1838. The Stratford to Newport Road more-or-less follows its 20th century line except there is no canal bridge to negotiate and it appears to go round the the triangle where Manor Farm cottages are located. One presumes that the road was straightened here when the canal was built. 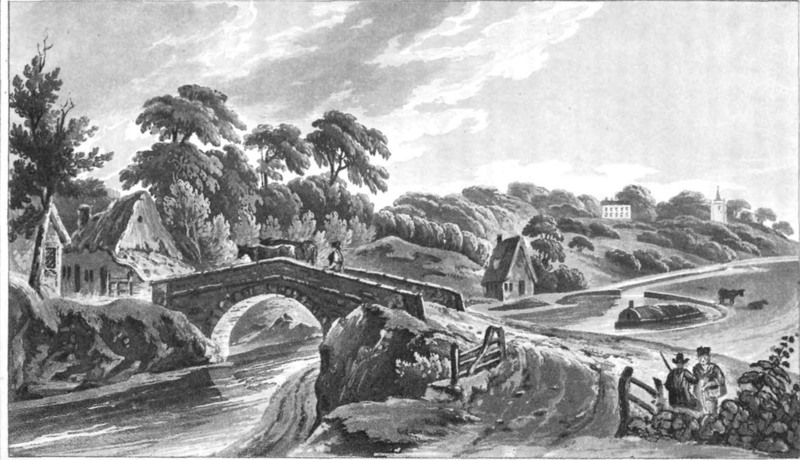 Indeed the drawing by JC Hassall made in 1819 does show an abrupt turn after the bridge. The turn to Haversham has also changed much. On this map it shows as a crossroads, with one branch going north to Mead Mill and thence to Haverhsam and Castlethorpe and turning south to Bradwell. This road was first cut by the canal and since it appears to follow the line laid by the railway was probably obliterated at that date. Part of it survived until recent times as a footpath from the Blue Bridge down to the old Pumping Station and across the brook to Bradwell. From 1837, travellers to Bradwell took the orad that probably marked the boundary between the Bradwell and Stantonbury manors. This road now goes up as far as Bradville before being cut off. There were two cross country roads: the low road that went through Old Wolverton and a high road, an ancient ridgeway, that linked Calverton, crossed the Watling Street at Gib Lane and continued eastwards on a line that would have joined Wolverton’s Green Lane before joining the Newport Road at Stantonbury. Note too the trackway that runs from Stacey Bushes farm in the south to Old Wolverton and Manor farm to the north. This partly survived in the 20th century as a footpath from the corner of the cemetery, crossing the Stratford Road, and following the Blackboards to Manor Farm. The Haversham Road has been much diverted. First the turn off to Haversham had to be moved to the east when the railway line and viaduct was constructed, and 40 years later when the loop line was built. there have been further modifications and road widening in recent times. The other interesting points about this map is that it was drawn a decade before Wolverton House, Wolverton Park Farm House and Warren Farm House was built. 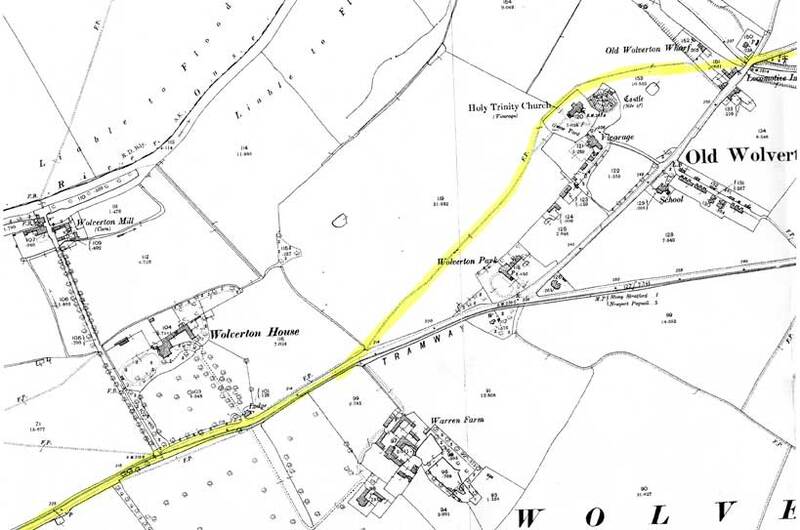 The mansion at Stantonbury, demolished a few years later, was still standing, and noted on this map as one of the more important houses in Norty Bucks. The cross country road from west to east has changed more times than we probably realise. Early travellers used high roads such as the one that follows Green lane in Wolverton, presumably because they could see potential danger from afar. As society settled valley roads were chosen because it was easier to move goods. The Portfield Way, as it was once called because it was a market road, (Port meaning market, followed a line from Calverton which led it past Horsefair Green, more-or less along its present line. However, opposite Warren farm it followed the present footpath up to Holy Trinity Church and then continued along the Old Wolverton Road, now to the north of the canal. This made perfect sense as the old medieval village was along this road before the enclosure clearances of 1654. I can only assume that the detour was constructed when the canal was built. 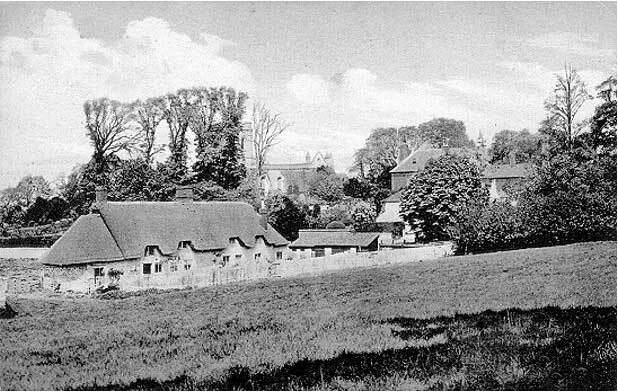 This left the church and its associated cottages isolated and may explain why the Wolverton Park Farm house had its access road at the back. Slated Row, Rose Cottage and the Galleon and its cottages are all 19th century buildings and became what we bought of as “Old Wolverton” – but not so old after all. The road from Stony Stratford to Newport Pagnell followed a perfectly sensible path along the Ouse Valley until it reached the hill where a climb to Stantonbury, either east or south was necessary. Hence the toll gate at the bottom of this hill. As you can see from the map below the road goes more-or-less directly to Stony Stratford avoiding the hill to what became Wolverton Station. This map was surveyed in 1830 and the railway line and Wolverton Station was added as a reprint in 1839. There are two additional roads – a road from the Old Wolverton Road along side the railway to access the station and the Radcliffe Arms, and a track over the canal, straight down the hill to Stonebridge house farm. Later this road took a trun towards Haversham and then continued east by the Drill hall. The railway also caused a change in the Haversham Road turn-off, as can be seen from this drawing. The course of the original road can be seen in the faint drawing. After 1860 the Stratford Road at New Wolverton was cut through to make a direct link. This became the main road between Stratford and Newport Pagnell and the Old Wolverton Road became a quiet byway. This changed in the 1960s when the land north of the canal was opened to industrial development. The road was widened and more industry has moved into the area. After Milton Keynes road and residential development the corner by Wolverton Park House and Primrose cottage was made into a cul-de-sac and a new road cut through to a roundabout by the Wolverton-Stratford Road. If you click below a Google map will show the present road configuration. Despite the advance in railways and rail speeds, road traffic continued to trundle along at the same pace as it had in the 18th century. The difference they would have noticed is that road surfaces had improved greatly. Many roads in the 18th century and earlier were impassable at certain times of the year and the cost of upkeep was borne entirely by the parish. And since they did not see this as fair as they often got little profit from it, the work was easy to neglect. This changed with the Turnpike Acts, starting in 1706. In fact the Turnpike Trust for the road from Fonthill to Stony Stratford along the Watling Street was the first Tutnpike Act in the country. I have discussed this turnpike here. Lesser roads, such as the road from Stony Stratford to Newport Pagnell had to wait another century for improvement. 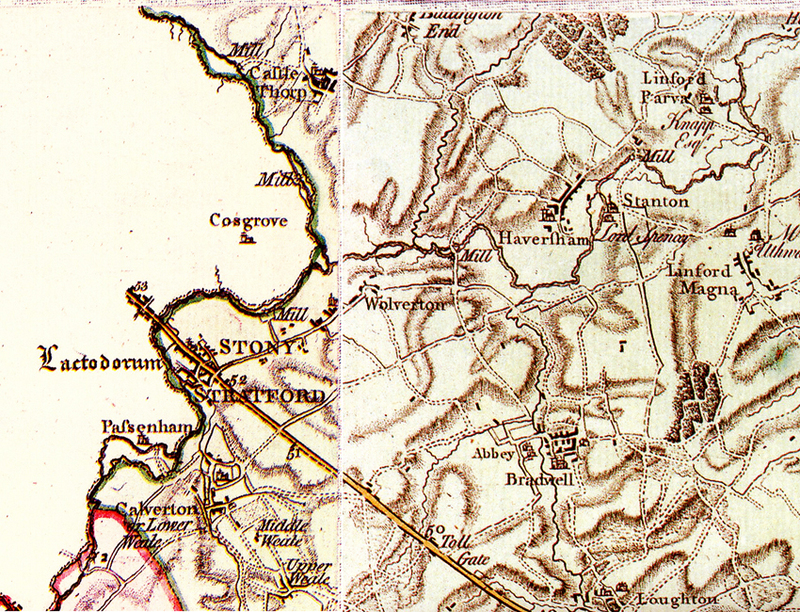 The Turnpike Trust for the Stratford to Newport road did not come until 1833, a few years only before the arrival of the railway at Wolverton. The Trusts were responsible for the upkeep of the road and were permitted to charge road users – thus building a up a fund to keep the road in good repair. There appear to have been two toll gates in our district. One was on the Wolverton Road near to the Wolverton Mill turn-off and the other was at Stantonbury, at the foot of the hill going up to Old Bradwell. At each place a cottage was built for the toll collector and his family. The first record of a toll collector was in 1841. I don’t imagine the job was well paid and the gate had to be manned at all hours. It appears that husband and wife teams were able to manage the work between them. The Wolverton toll gate shows Samuel and Rebecca Bull, both 30, with four small children in 1841. A decade later Joseph and Elizabeth Marlow, both in their late 50s, were operating the toll gate between them. In 1861 George Goodman was the toll collector. He lived there with his wife Mary and three children. By 1871 tolls were no longer collected and the house was occupied by William and Hannah Reynolds and their two small children. There is no reference to any habitable building there in 1881 and it may have been pulled down. There is a similar pattern of occupancy at Bradwell. Nobody held the job for over a decade. The next toll was at Newport pagnell. Two Mile Ash stood on the Wolverton side of the Watling Street, two miles south of Stony Stratford. The name is now preserved in the housing estate recently built in this area. The question is, why was it so called? What was the purpose of this ash tree more-or-less in the middle of nowhere? It is not possible to say with certainty but I suggest the name may date back to the 18th century when the turnpike act allowed the collection of tolls to pay for road maintenance. Laws passed in 1555 placed the responsibility of road upkeep on the Parish, which may have seemed like a good idea at the time but in practice ineffective. Parishes which bordered a relatively busy road like our Watling Street saw little advantage to themselves in paying for the upkeep of a road that was used by through travellers and as a consequence roads were generally in a bad state of repair. This after 250 years of literally patchy roads was the government’s better solution, which was to allow the Parish to charge the users of the road and apply these monies to road upkeep. This Act of 1706 was the first Turnpike Act. The Act set out a scale of charges which entitled the user access to the road from sunrise to sundown. I don’t want to review the effectiveness of this act or subsequent ones but it did result in a toll bar being placed at Two Mile Ash. Why here? Well it marked the boundary between Wolverton and Loughton on the east side and Calverton and Shenley on the west side. The toll bar would also catch potential users joining the Watling Street from Green Lane as well as those coming from Loughton and Shenley and from the Newport Road. I assume that the tolls collected here enabled travellers to travel the length of the Trust’s highway as far as Hockliffe, if they so wished, although in practice distances wouod be shorter for local traffic. The money collected was administered by a Turnpike Trust, comprised mostly of members of the Squirearchy. I imagine that an ash tree grew on the site, which is a high point on the road, to mark the location of toll bar for travellers. Had it been an oak tree we would have called it Two Mile Oak.